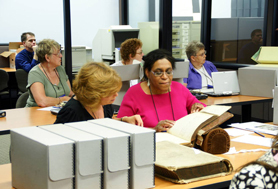 We are now accepting applications for Primarily Teaching—our summer institute for educators on using historical documents in the classroom. Learn more and apply online. Digitization of documents related to these case studies will be our priority. You will find between 3 and 5 items (documents, photos, maps, etc.) to scan and describe. We will add these to our online tool for teaching with documents—DocsTeach.org—while participants are onsite. During the workshop, you’ll produce a DocsTeach learning activity using the digitized materials. After guided research using the case study, you will have the opportunity to continue researching the case study, or to go on to independently research a more specific topic of your choice related to Leadership and Legacy. and campus unrest in the 1960s. I’m interested in signing up for the Boston class. Hi Jennifer. You can find instructions for applying to the Primarily Teaching Workshops at http://www.archives.gov/education/primarily-teaching/. Pingback: Education Updates » What Are Your Summer Plans? Are accommodations provided or assisted with in any way? Hi Jennifer. Participants are responsible for their own food, housing, and travel arrangements. Please let us know if you have any further questions! Thank you!